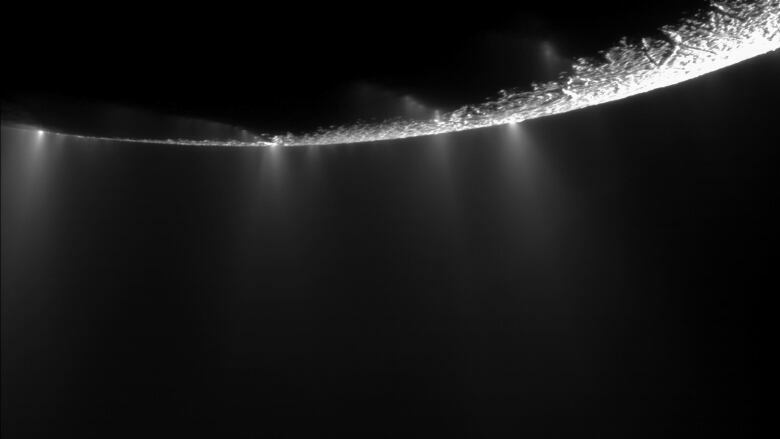 An ocean of water sloshes deep under the icy south pole of Saturn's tiny moon Enceladus, a new study suggests. The new finding, based on data from NASA's Cassini spacecraft, may explain the geysers of water spouting from "tiger stripe" cracks in the moon's surface that were previously captured by the spacecraft's cameras. It also adds to evidence that Enceladus may be able to support microbial life. Enceladus is one of 53 known moons orbiting Saturn. It is just 500 kilometres in diameter – smaller than the length of the U.S.-Saskatchewan border. The moon is covered with a coating of clean, white ice that makes it "exceptionally bright" said Dave Stevenson, a planetary scientist who co-authored the paper published online in Science today. Enceladus's newly discovered ocean is located 30 to 40 kilometres below the surface and occupies an area about the size of Lake Superior. It may extend from the south pole halfway to the equator or more, Stevenson told CBC's Quirks & Quarks in an interview that airs Saturday. "It's even possible that it's global," he said. "All that we can say for certain is this layer of water is thickest at the south pole." Deep crevasses in the surface ice may extend down dozens of kilometres all the way to that ocean, feeding the geysers first spotted by Cassini in 2005. How is it possible that water could exist in a place with a surface temperature that averages -200 C? Stevenson said the key is Enceladus's unusual orbit around Saturn, which is more elliptical and less circular than is typical for a moon. Because of that, Saturn's gravity pulls Enceladus unevenly at different points in its path. "This causes the ice to be squeezed and squished, and as a consequence there's heating, and from that heating water is being produced." The research team led by Luciano Iess of Sapienza University in Rome detected the water by measuring the tug of Enceladus's gravity on the Cassini spacecraft during three flybys between April 2010 and May 2012. Based on the way the moon's gravity changed Cassini's flight path, the team was able to figure out how mass was distributed within Enceladus. What they found was that at the south pole, there was a layer of material that was denser than ice. The most likely identity of the denser material was water. The measurements also suggest that the ocean sits on a bed of rock that "provides potentially some of the materials necessary for life," said Jonathan Lunine, a Cornell University planetary scientist on the team, at a press briefing organized by Science. Other chemicals necessary for life, such as salts and organic molecules, had already been detected by Cassini on Enceladus, Lunine noted. "So it makes, in fact, the interior of Enceladus a very attractive potential place to look for life." Enceladus isn't the first body in the solar system discovered to have an underground ocean. Jupiter's moon Europa, which is much bigger than Enceladus, also has one. But Lunine said it's not yet known whether there are any organic molecules on Europa. Lunine said he doesn't know which of Enceladus or Europa is more likely to harbour life. "It might be both. It could be neither and I think what this discovery tells us is that we just need to be more aggressive in getting the next generation of spacecraft both to Europa and to the Saturn system once the Cassini mission is over."